Commissions - The Joyous Quilter - Quilts and Patterns For Sale, Commissioned Quilts, Quilt Gallery, Quilting Tips & Tricks, Quilting Green and more! 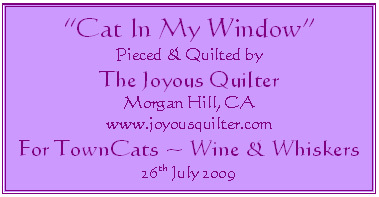 Joyous Quilter is Delighted to Provide the Service of Creating Commissioned Quilts for You! Imagine giving the gift of a unique and beautiful quilt which your friends and family will admire, or perhaps a quilt full of treasured memories for you to enjoy. Or simply indulge yourself in a beautiful quilt to suit your decor or fulfill an artistic whim! As I discussed on the Home page, quilts (and quilted items) have a wide variety of uses; art, warmth, decoration, elegance or fun and more! I love the challenge of creating something new and individual and will be delighted to hear your ideas and enlighten you as to the boundless possibilities, and together we can create quilt magic! If you haven’t already visited my Quilt Gallery pages (one, two and three, plus the Commission Galleries One and Two), please do, as you will see what I have created so far, and you may get inspiration there. Also, you may like to take a look through my suggestions below. Further down you will see the process of Commissioning a quilt. I work with special software which is specifically used for designing quilts, called EQ7. Integral to the software,there are over 6000 block designs to choose from, however don't let this overwhelm you. In discussion, I can discover what you like and make some suggestions as to designs that will work well, depending on the kind of quilt you like, and together we can create a stunning quilt. I can also design blocks to make a quilt that is unique to you. For example, most of the quilts in the Commission Galleries were designed this way. Most quilts are made from a pattern of which there are many thousands of beautiful and clever designs and I would be happy to help you select a pattern. You may also like to look through my Quilt Gallery pages which contains many quilts made from patterns and I would be happy to make a similar quilt for you. NOTE: Please bear in mind the exact same fabrics as shown in the Gallery may no longer be available, but I can often source something similar or we can go in a different direction in terms of color scheme or fabric style which may work better with your decor. I can often use an image you already have, like the two I made for my friends in Florida, "Composition Alpha" and “Change & Flow” (see the very beginning of the Commissions Gallery). If you already have an image I would need to see it so that we can discuss suitability for quilting. You may already have a design in mind that you would like to turn into a unique heirloom. A memory quilt comes in several variations that may memorialize different occasions or loved ones ~ more on this below. There are thousands of designs and patterns to choose from, but the simple rule of picking a color that appeals to you is a good beginning, and we can work from there. I will be happy to give you suggestions on fabric choices and color schemes which will compliment your decor, fabric(s) you already have, or simply start with your favorite color. A quilt made for you or your loved ones can celebrate or commemorate a variety of occasions, including; the birth of a new baby; a birthday; a wedding; or a graduation. Friendship quilts usually have blocks with a plain piece in the design onto which special messages can be written with fabric pens, or embroidered, prior to construction. A unique idea to create wonderful memories from your wedding day is to provide all your wedding guests with specially selected squares of fabric (I would be happy to assist with the selection) and permanent fabric pens with which they can write their own special messages to the happy couple during the wedding festivities. The squares may then be incorporated into a quilt to preserve the fun and happy memories of the day. Specially treated fabric is available to allow photos to be printed directly onto the fabric which can then be incorporated or featured in a quilt. These are great in a Friendship or Wedding quilt! The range of colors and designs on T-Shirts these days is infinite, but here are a few ideas of what may be interesting on a quilt; College logos, sports teams, rock bands, charity events, witty sayings, etc…. NOTE: Please leave T-shirts whole to allow for all design possibilities! Clothing that characterized the particular style of a loved one can be incorporated into a quilt that, particularly if that loved one is no longer with you, can be warmly wrapped around you like a hug. NOTE: Please leave clothes whole to allow for all design possibilities! Pricing varies according to the size and complexity of the quilt, or additional materials used, such a stabilizer, to allow T-Shirts to be more workable. There will be a separate cost stated for the various materials, the labor and the quilting. JQ will discuss with you the possibilities and design elements and then provide you with an estimate so that there are no nasty surprises at the end of the process. 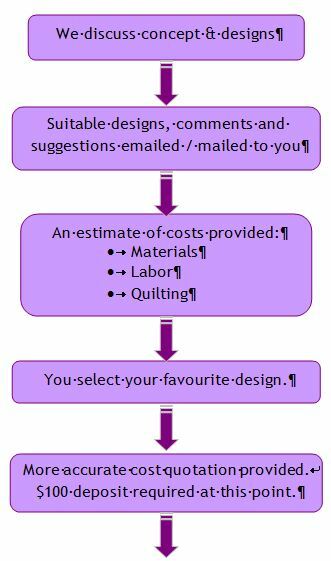 Calculating the cost of a commissioned quilt is based on a combination of the materials, time, the level of complexity of both piecing and quilting and the finished size. The general rule is that the bigger and more complex they are, the more expensive they are, however, there are exceptions to this rule as in the "Oak Leaf Wedding Ring" which was small at 20" x 20", but took many hours to produce because of the complex technique. The length of time a quilt takes to make will also vary depending on the size and complexity of the pattern and quilting. Ultimately as much time as possible prior to any special event is best to ensure timely delivery. As a general idea, a baby quilt of approximately 50” x 50” can be comfortably completed within a week. This includes selection of fabrics after a design has been chosen. A queen size quilt may take 5 to 6 weeks and possibly longer if the pattern chosen is complex (or my schedule gets crazy!). The length of time will be discussed and outlined during the initial concept discussions. To give you an idea of how much work goes into a quilt, take a look in the Gallery at “Composition Alpha” – this quilt took 51 hours from start to finish (once the fabric was obtained). “Change & Flow” took 71 hours – an entire working week, and then some! These are perhaps the most extreme examples as there was no pattern to follow for either, so I had to create my own templates. The process begins by assessing either materials that you already have (for example, T-shirts or clothing of a loved one, photographs, number of wedding guests etc), or discussing and advising on fabric choices currently available which suit the nature of the quilt you would like made. Of course, if you prefer, the choice of fabric can be entirely left to the Joyous Quilter, which is something she is particularly fond of doing! After an initial concept discussion, a range of design ideas will be provided to you via email from which you can select a design from those presented, or elements of different designs can be combined to create the look and feel you desire. A few days later, JQ will provide you with a Commission Order Form with details of our discussions and a more accurate quotation based on the previous design choices. This quotation will only change if the design changes after this point. Once you have selected one of the designs, fabric yardage will be calculated and purchased and payment for materials will be requested at this time, along with a $100 deposit on the labor cost. Work on the quilt will then begin in earnest and you will receive regular progress reports, usually via email. Throughout the whole experience you will be continuously informed of costing and progress and, if necessary, consulted about design options should something occur differently than originally discussed. Once the quilt top is complete and the backing is suitably prepared according to the design, we will discuss the quilting that is appropriate. Quilting is the part where the three layers (top, batting and backing) are joined together by threads that are visible on both sides, therefore the quilting design is just as important as the piecing design. The quilting is a separate cost because it depends on the complexity of the quilting desired and quilting is charged by the square inch. In the interest of a reasonable timescale I use a machine to quilt. Although I can hand quilt, it takes a whole lot longer and I would like you to have your quilt in a timely manner! However, every bit of the design is guided by hand and therefore every quilt is unique and has a unique and appealing hand-finished look and feel. For more details about the different types of quilting, click here. Every quilt should have a label as a little piece of history denoting where and when the quilt was made, by whom and for whom the quilt was made. I would be delighted to include a short message from you to the recipient, especially if the quilt is to be a special gift. To the right are a couple of examples of what a label can look like, however, the color of the background and lettering can be anything you like. 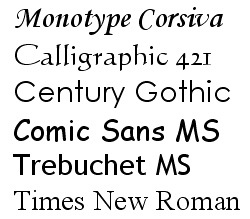 Most fonts are available, and a few are shown below the labels, although a request for a certain font can often be possible. Once the quilt is complete with binding and label, it will be delivered to you on receipt of full payment. If you are not local, the quilt will be carefully packaged and shipped to you using Priority Mail standard shipping charges. If desired, insurance can be applied at the time of shipping at additional cost. 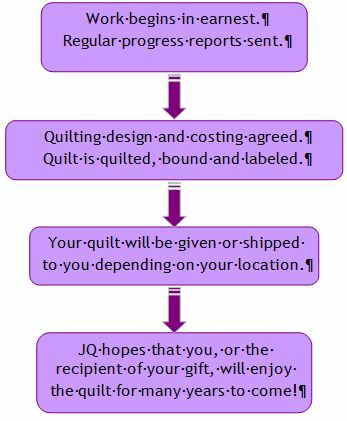 JQ hopes you, or the lucky recipient of your gift, enjoys the quilt for many years to come! Full laundering, care and storage instructions are included with my compliments. If you would like a quilt made on commission, please contact JQ via email; joyousquilter@gmail.com, providing your name and a phone number (the best to contact you on) and the best time for JQ to call you back. I will endeavor to do everything possible to ensure that you are happy with your quilt!